Featuring guitarist Dave Ledlin and Charge Group's Blackman, Jesson and Rossetti (Rossetti replacing founding drummer Dave Hector in 2002), Purplene were a band whose life began in the industrial Australian city of Newcastle in 1996 and culminated in the release the Steve Albini-recorded Purplene LP in 2004. Renowned for their few-and-far-between performances, a distinctively angular guitar interplay and an unusually large chasm between their quiet and loud moments, the group peacefully disbanded in the spring of 2005 as one of Sydney's most respected rock groups. Featuring the powerful twin guitar attack of Tim McPhee (Firekites) and Alex Nevin and the pounding rhythms of Charge Group/Purplene's Matt Rossetti and Adam Jesson, Newcastle's The Instant slowly evolved out of early childhood Rossetti/McPhee/Nevin school jams into one of Australia's great experimental guitar rock groups. Initially using the moniker Audiophile, the band quickly set about dominating the Newcastle indie scene with their explosive and beautifully dischordant instrumental bliss. Following many demos and a 10" single, The Instant gave birth to their brilliant 60-minute debut Notes & Errata in 2006, recorded by Steve Foster (Gerling, Ukiyo-e, Purplene). 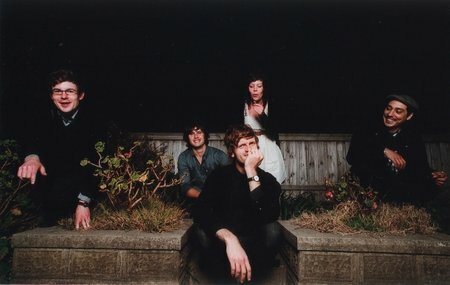 The band have been on indefinite hiatus since 2008. Formed in 1998 by Jonathan Blackman (guitar/bass/drums), sound engineer Steve Foster (guitar/bass/synth), Matt Grant (guitar/synth, ex-Tweezer), Chris Hamer-Smith (guitar/synth/drums, now working as hip-hop producer Chasm) and Matt Blackman (drums/guitar/synth), instrumental post-rockers Ukiyo-e were a pivotal fixture in Sydney's late-'90s experimental indie scene that centred around the legendary Hopetoun Hotel in Surry Hills. Equal parts sparse, atmospheric, slow-core, cinematic and jazzy, Ukiyo-e were known as much for their music as for the extensive periods of tuning and swapping instruments between songs. Following a 4-song demo and the Bloodshot/Mixed Doubles 7" (on Handpressed), Ukiyo-e set to work on the critically acclaimed debut album Inland (Trifekta, 2001), recorded by Steve Foster and Matt Maddock at Adelaide's Mixmasters Studios. Extensive national touring followed, as did the ambient/experimental remix album Experience Makes You Dumb (Trifekta, 2003), featuring remixes by Oren Ambarchi, Pimmon, Chris Smith and Casey Rice. The release coincided with the band's decision to cease operations, leaving over an album's worth of well-worn live material unrecorded. Spawned in Perth, the most isolated industrialised city in the known world, The Tucker B's have been the mad-scientist plaything of guitarist Matt Rudas and bassist Andrew Houston ever since they finished high school. Evolving over the years with a steady array of arrivals and departures, the Tuckers most recently ensnared guitarist/electronics wizard Darren Nuttall since 2003's breakthrough third album 'Bish Bosh II: The Bosh Bosh', Matt Blackman (Charge Group, drumming since 2007) and keyboardist Brent Griffin (SPOD, since 2009). The grand overlords of their self-created "fantasy rock" genre (chaotic country-tinged indie sweet metal sludge) have gone on to release two more albums ('Chubby' in 2005 and 'Nightmares in the Key of (((((Wow)))))' in 2009), move to Sydney, tour the USA, perform at summer festivals and tour Australia with Wolfmother. Tucker B's shows are known for being physical, colourful, unique and rare celebrations of awesomeness that must be experienced firsthand to fully understand. Formed around Newcastle guitarists Tim McPhee (The Instant) and Rod Smith, Firekites gradually workshopped their jazzy minimalist acoustica over a number of years jamming and recording, until finding a resonant niche in 2008's acclaimed 'The Bowery' - a soothing exploration of refined electronic-infused acoustic pop, also featuring esteemed vocalist Jane Tyrell. All four Charge Group members were enlisted, in varying levels of capacity, to provide guest instrumentation on the record, with violinist Jason Tampake becoming an occasional touring member of the band. Firekites are currently working on album number two.